If you’re trying to figure out how to mentally prepare for labor, know that you are NOT alone in that. I think the BIG difference between the pain from breaking an arm and the pain of labor is that one of these “pains” are anticipated, and other..just happens sometimes. Of course, there are other differences – but we will get to those a little later. In my opinion, that makes mentally preparing for labor SO important, because the build-up to labor WILL make your labor harder if you sit and psych yourself out about it. I wanted to share some of the best ways that I have found to mentally prepare for labor – with many of these things being stuff that actually helped me. For me, part of what freaked me out about labor was all of the birth videos I watched with screaming women, tears, guts (ok maybe not guts), and blood. Natural birth was NOT for me. I also think that women should be empowered to make the best choice for themselves, so if you want a natural birth – have a natural birth! I just have to say (with love) that I don’t get the being in pain intentionally thing. 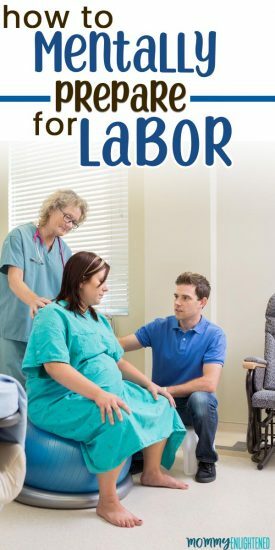 You can educate yourself on the whole labor thing without watching that kind of instructional videos. Or at least if you’re going to watch them, make sure they have some solid info behind them. Personally, I really liked Hilary’s teaching style (she’s an L&D nurse with an L&D course for couples found here). She will give you ALL of the info you will need to be comfortable and confident with your birth (and yes, it’s better than Baby Center’s free option but you can check that out here if you’re interested). If you are looking for info on natural birth – I recommend looking at alternative options that are more geared toward something natural. Regardless – I know that getting educated is probably one of the most important steps to becoming mentally prepared for labor. You have friends and family that have been in the same situation you’re in right now. So ask them about their experience. As you know, every experience is going to be different. But – the thing that your current friends and family have in common is they survived, and they are happier for it. I love doing research, so hearing all of the different stories helped me have a more well-rounded understanding of the things that could happen. As long as you remember NOT to psych yourself out because even if your friend went through 20 hours of labor that ended in a c-section – that doesn’t mean that will happen to you. Make sure and discuss any potential concerns you have with your doctor or midwife. You have someone that can give you personalized advice and information regarding YOUR situation. You can’t have that kind of relationship with anyone else in your life. Your friend, mom, or Dr. Google can’t give you information on what you should actually be concerned about, so take advantage of the relationship with your doctor. One of the most simple breathing exercises that you can start practicing now is called patterned breathing. Although I say it’s simple – there are different breathing patterns recommended for different stages of labor, so it IS something you’ll want to practice. Breathing is an excellent way to keep yourself calm and manage your pain, which is why it’s an important way to mentally prepare for labor. Labor is one of those things that we can’t really do a lot about..it’s going to come regardless of whether we think we are ready or how much we prepare for it. I got to a point where I had learned what I needed to learn about childbirth, but I was still pretty scared about it. I obsessed about it. Don’t do that. Despite the fact that I had educated myself and was empowered to make my own decisions (see below!) I was still scared. Scared of being in pain, and scared of what could happen to me or baby. Mentally preparing for labor meant distracting myself with other things sometimes (and that’s okay). Spend some time looking in the mirror and tell yourself out loud that it’s going to be okay. I know this seems a little silly, but remember that our minds are very powerful things, and we can convince ourselves of (almost) anything that we want to. Yes, there’s a chance that you still may experience complications. Even if you do everything right, sometimes things just go wrong. The unfortunate thing is, you can’t do anything about it. I GET how hard it is..trust me. I had plenty of sleepless nights when I was pregnant with my first daughter because I was SO worried that things would go terribly wrong. But…they didn’t. And they usually don’t. If telling yourself it’s gonna be fine helps calm your nerves a little – do it. Staying calm will be the most beneficial when you are mentally preparing for labor. If you find yourself filled with doom and gloom about your upcoming birthing experience, take a look at the actual statistics surrounding childbirth. I will say, the numbers are higher than they should be – but really, ANY complication that results in something serious is too many. Although these scary things are always a possibility, it’s still more likely that it won’t happen. Not to mention, there are usually some things you can do to help minimize the risks. We always HEAR about worst-case, but worst-case is usually the least common thing. It’s like plane crashes…did you know we actually had a huge increase in death by a car accident after 911? People were scared of terrorists and had a belief that being in a plane was going to be more dangerous than riding in a car. A doula (just in case you didn’t know) is a birth coach that helps guide and support you through your labor and delivery. These women are usually NOT trained in obstetrics at all, but they can still work some magic. One of my single mom friends wasn’t going to have anyone at her son’s birth (yes I offered but she lives far away and it wasn’t realistic). She ended up hiring a doula. Her doula did such a fantastic job keeping her calm and focused, she said it was literally a lifesaver. If you don’t feel like you can mentally prepare for labor, consider hiring one. Get as much sleep as you can right now. Sleep was incredibly uncomfortable for me when I was pregnant, and I kind of wanted to punch people who would tell me to “rest now because you won’t once the baby gets here”. Which surprisingly…I slept better AFTER baby was here. But – if you can sleep, you should. Stay hydrated and eat as healthy as you can manage. Honestly, I ate what sounded good, which was often NOT the healthy option. And in reality, that’s okay. Just remember to try and avoid overdoing it because a sick stomach on top of your anxiety will make things harder for you. Also, staying healthy will help keep your energy up, which in turn will help you have the strength needed for labor. If you go into labor with the expectation that things may not work out the way you hoped, you will be a lot less disappointed when things don’t go according to plan. For a lot of us, losing that element of control is VERY scary. I know it was for me. Luckily, our bodies are kind of made for this childbirth thing. So even if the tiny details don’t work out the way we had hoped, the end result will likely be the same. That is the MOST important. Don’t hold onto perfection. Now, birth plans do not always work out, but having a plan will make you feel better in the meantime. Remember, YOU are empowered to make decisions regarding what’s best for you and your baby. Want to use a mirror or play 90’s music while popping out a baby? You can do BOTH of these things. I wanted to be induced. I know that there are some mothers out there that would slap me for this, but it’s one of those things that I discussed with my doc and made the decision for what was best for me and baby. It was most definitely the RIGHT decision for us. I got an epidural, was induced, and had a perfect baby girl seven hours later. I didn’t feel a THING – and that was exactly what I wanted. We watched movies, laughed, cried, and sang together. When it came time to push, it took three pushes and she was out. My second birth was quite similar. Got an epidural, induced, and a baby shortly thereafter. Of course, I was more anxious with the second one, but it was still painless. When I look back at my birth experiences, I am incredibly grateful for them. They were perfect the way that they were. Even if that wasn’t the case, I got the perfect humans out of the experience, so it would still be worth it. Maybe that’s not the birth story you want for yourself – and that’s okay. But know that you have the right to choose the experience you want (as much as you can anyway). Okay look, mama, I KNOW how scary labor is, but I also know that you will likely be surprised at how bad it really ISN’T. Really, mentally preparing for labor can be broken down in just a few steps. Educate yourself. Make a plan. Accept that it’s going to happen, and it’s going to be okay.